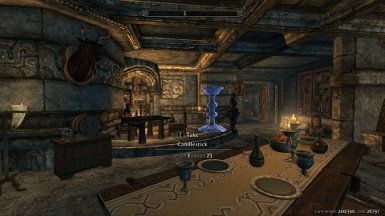 Allows accurate placement of items for decorating. As of version 3, this mod will no longer support localization. The mechanics for supporting multiple languages were just too complex and cumbersome. Please use older versions if you need something other than English. Removed activation/deactivation script that was part of Jaxonz Utilities. Removed quest state that was causing it to be non-responsive. Added missing file to distribution which prevented command console selection of objects. Added diagnostic code to validate installation of custom SKSE plugin DLL. Repackaged as loose files. It was determined that SKSE plugin DLL would not work within BSA. Repackaged distribution with single BSA. Added object reset feature which returns objects to factory-original position. Fixes archive error for translation files so the $text does not appear in dialogues. Updates French translation file to cover 2.1 feature set. Added ability to directly select and manipulate lights, just like any other object. Added user-configurable collected static weight. Minor cleanup, streamlining, and speed enhancements. Enforce object locations on game load. I would be thankful if you check it out and PLEASE REPORT YOUR RESULTS. I cannot yet "bless" it as final. * Removed all MoveTo, SetPosition, and SetAngle calls, replacing them with the more stable TranslateTo function. * Added "no drift" markers for objects you position and lock in place. These markers are intended to correct any object drift or sinking that some users report. Implements new selection method, allowing for command console input. Makes scaling operations more responsive and smoothe. Undo now undoes object scaling. Allow fixtures without light sources to be scalable and copiable. This is a BETA release that significantly changes how objects are selected. It uses an SKSE plugin, that should be automatically installed, to allow easy and accurate selection of ANY object via the command console. The Advanced Options "update statics" and "revert statics list" are no longer needed. It is highly recommended (but not required) to install Mfg Console, which provides additional information on objects selected. 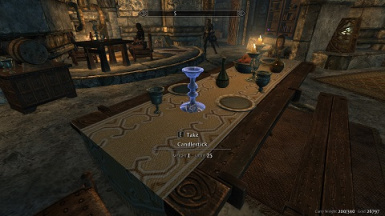 http://www.nexusmods.com/skyrim/mods/44596/? PLEASE PROVIDE FEEDBACK ON HOW THIS WORKS FOR YOU, especially if there are any new issues. Selecting light fixtures can locate and move nearby light sources. Prompt user for name when collecting objects to inventory... better than numbered tokens. Fix bug that caused dropped tokens to vanish. Changed so that dropped token items appear above floor so that banners, etc. do not disappear below floors. Adjusted list of known items to prevent confusing selection of invisible objects, mists, fogs, etc. Added object scaling for simple objects and mannequins. Copied objects inherit scale of original. Added warning/workarounds popup message for known Skyrim bugs. Hopefully this will avert some common user problems. Fixed issue where setting hotkey disabled MCM menus. Updated object selection methodology to use SKSE 1.7.1 for greater accuracy. Complete refactoring of code base. Position complex objects: Mannequins, Weapon Racks/Plaques, Display Cases. Learn new objects from DLC or 3rd party content. Also allows positioning ANY static. SHOULD BE CONSIDERED BETA. Not widely alpha tested. Help info and translation information is not complete. Removed DLC items which was causing CTD for users without DLC. Those users with all DLC can continue to use version 1.9 without issue (1.9.1 will actually allow them to move fewer items). Incorporated known statics from DLC, so no patch required. WILL STILL WORK if you have none, some, or all DLC. Added ability to move mannequins. Still cannot yet grab them to inventory. Added a ton of new statics enabled to move, including light fixtures, trees, more furniture, statues, and some special objects. Added ability to select many statics which do not have activators. Now you can move tables, mounted trophies, and just about anything else. Added ability to capture statics to your inventory. This allows you to bring home treasures and curiosities from your adventures. Added function to lock all items of the current cell in place. 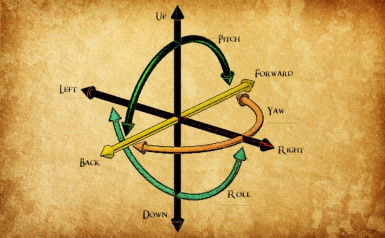 This is useful if you have a playerhome that is well arranged and want to make sure that NPCs, random havok events, or you don't topple things over. Added ability to select an object without first grabbing it. Just point your crosshairs at it so that the action verb shows (.e.g, "Take") and press the Select key. This also allows you to move furniture with actuators (chairs, beds, workbenches, containers, etc.) with Positioner. Please don't even try to move complex furniture such as active bookcases, mannequins, or weapon racks; that is just asking for trouble. Added missing reference that could cause menus not to show up in MCM for some people. Addressed issues that seem to have caused functionality to stop after save game. By popular demand made all keys remappable. 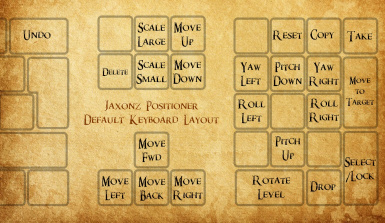 This should accommodate users who use arrow keys for movement, laptops without keypads, etc. Includes French language version courtesy of NaeSoem. Will automatically switch language depending on your Skyrim.ini setting. Packaged better for NMM. Should work for everyone now. Please let me know if that is not the case. 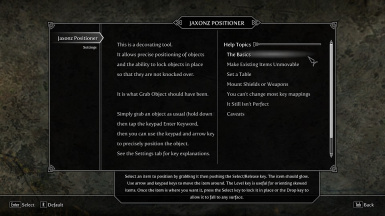 Move objects, furniture, mannequins, weapon plaques, and just about anything else with Jaxonz Positioner. No more fumbling around! Positioner gives you fine motor skills to move things around with absolute accuracy. Move practically any object in the game, including grabbable objects, furniture, containers, and statics. 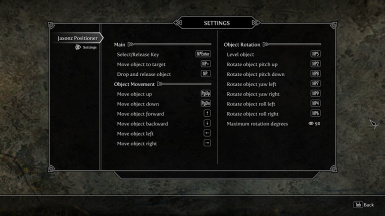 Move complex objects such as mannequins, weapon plaques, and display cases. Collect any grabbed static as an inventory item and take it home. Lock objects in place to prevent them from being disturbed, either one at a time or in the entire cell. Undo mistakes, for worry-free editing. Manipulate objects from DLC and 3rd party mods. Select and manipulate lights! New! Positioner is what grab should have been. Positioner feels "built into the game", so there are no silly spells or special abilities. When the object is positioned where you want it, press keypad "." to drop it there, or press keypad Enter to lock it in place. 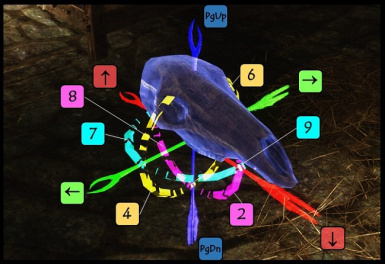 Positioner provides in-game helpful hints for common operations. There are also diagrams for keypad layout and object operations. Your imagination is the only limit. 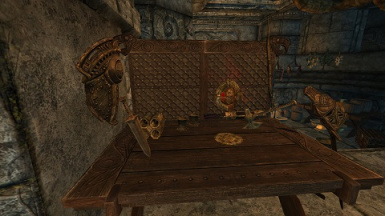 Mount weapons on walls without plaques. Decorate your halls with banners, trophies and memorabilia from your adventures. Set a banquet table. Build a monument. Just look at the many user-submitted images of all the beautiful (and sometimes crazy) things people have done with Positioner! "That's incredible. Works like it's part of the vanilla game." "I LOVE this mod. If i could endorse it 2,000 times, i would. Thank you, thank you, thank you!" "...Jaxonz Positioner should have shipped with the game. This mod is so logical and unintrusive that it seems like it's from Bethesda itself. " "Firstly, omg I love you. I have spent many MANY hours using the console to decorate so this mod is a dream come true XD"
"Jaxonz you are a God. I love this mod. It was easy to learn and master. I have no idea how I decorated homes without such a beautiful creation, those were dark times indeed." "Absolutely amazing mod, i have no idea how i did without this before." Capture friends, foes and corpses to inventory, which resurrect when dropped. Scale people and creatures. People deform if dropped. Damage scales with size. Resolve conflicts from 2 modes that place objects in the same place by adjusting locations. Collect a catapult from a siege area and use it to deal damage to a dragon or other enemies. Positioner is fully compatible with DLC and 3rd party mods. It can even manipulate them. Positioner is not known to conflict with any other mod. Any load order works. All Positioner keyboard assignments can be easily changed to avoid conflicts. Positioner adds no scripts to the objects it manipulates, so Positioner can be cleanly uninstalled at any time. Objects that have been positioned will not revert. Need furnishings? Check out the Lance's Show Room companion mod.